Ceramic Fire Log Sets Double Sided 360 Degree White Birch is the answer to enjoying your Outdoor Fire Pit without the concerns of Natural Wood Burning and all the Hot Embers Floating around and potentially catching fire. 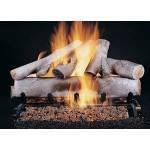 Our Ceramic Fire Log Sets look so real you will think you are Burning Real Wood. Save money and Clean up. Convert your Outdoor Fire pit to a Clean Burning, Safe Outdoor Fire Feature Design. 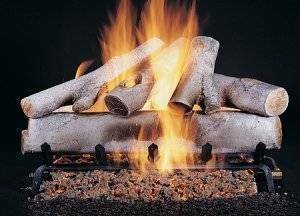 Our Ceramic Fire Log Sets are able to withstand High Heat but yet look so real and will give you years of enjoyment. Outdoor Fire and Patio is the leader when it comes to all your Outdoor Fire Pit Needs. We carry a large selection of Outdoor Ceramic Fire Log Sets and have many Different Sizes to Choose From. If you are interested in a Ceramic Fire Log Set for your Outdoor or indoor Fireplace and like what you see contact our office and one of our staff will assist you with your size. Outdoor Fire and Patio also carry's all Outdoor and Indoor Fire Accessories to complete your Fire Feature Design.